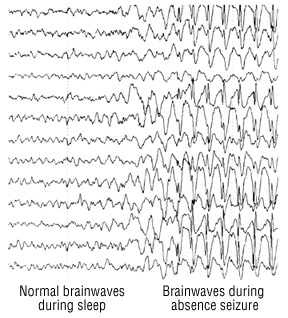 An electroencephalogram (EEG) is a recording of the brain's electrical activity. Metal electrodes attached to the skin on the outside of the head transform electrical activity into patterns, commonly called brain waves. A polygraph machine records the brain waves. In some cases, the waves are transmitted to a computer screen. A basic EEG takes about 45 minutes, with a range of 30 minutes to 90 minutes. Lightweight EEG devices allow people to walk around and perform normal daily activities while the devices detect and record brain waves over longer periods of time.